Greywater is washwater. That is, all wastewater excepting toilet wastes and food wastes derived from garbage grinders. 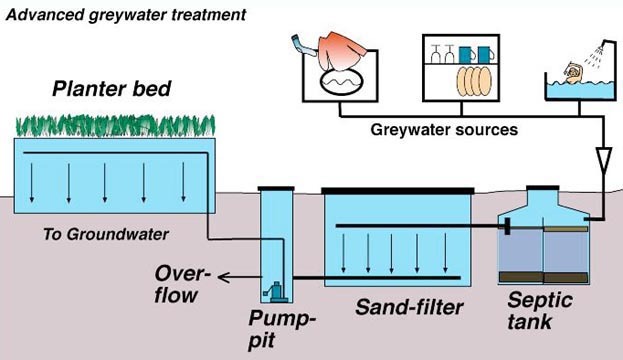 There are significant distinctions between greywater and toilet wastewater (called "blackwater"). These distinctions tell us how these wastewaters should be treated /managed and why, in the interests of public health and environmental protection, they should not be mixed together. Nine-tenths of the nitrogen contained in combined wastewater derives from toilet wastes (i.e., from the blackwater). Nitrogen is one of the most serious and difficult-to-remove pollutants affecting our potential drinking water supply. Medical and public health professionals view feces as the most significant source of human pathogens. Keeping toilet wastes out of the wastewater stream dramatically reduces the danger of spreading such organisms via water. 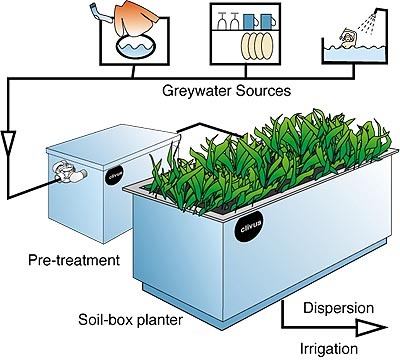 The implication of the more rapid decomposition of greywater pollutants is the quicker stabilization and therefore enhanced prevention of water pollution. (see graphs Fig 2. & 3. ).